Please submit your final folio on a data CD or DVD. Below are the steps to follow if you are using the Burn program on the Macs at Uni. 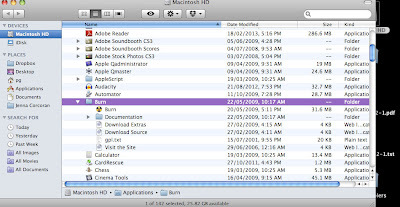 Open the Burn application from the Applications folder. Ensure the 'Data' button is selected from the 4 choices along the top. Title the disk with your name. 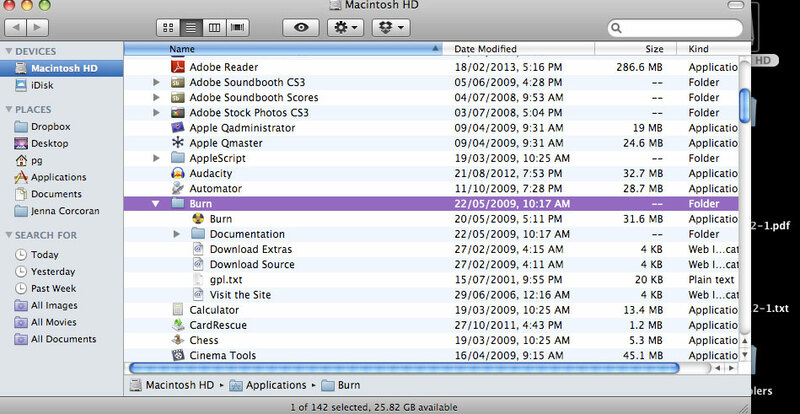 Change the format to Mac + PC (this means you will be able to view the contents of the disk on both operating systems). Drag and drop your final artworks from the desktop onto the Burn window. Please ensure the works are titled clearly, so when we are marking we can easily identify your photos from your collage. Your still images should be .jpg and your video should be .mov files. Click Burn. Insert disk. You can check the 'allow more sessions' box. This will allow you to continue to burn files onto the disk until it has run out of space. Wait for the magic box to put your pretty pictures and video onto the shiny round thing. Label shiny round thing clearly with your name and student number. Include a stamped self address envelope if you would like you disk returned. Hand in to your lecturer with relief and a smile on your face.